The Sanitizer™ Toilet (Patent Pending) is an all-American product. It is the only system that completely sanitizes human waste on-site continuously! Dramatically reduces water bills by saving traditional “flush” water. 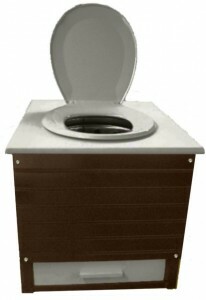 The Sanitizer™ Toilet is ideal for many sanitation challenges. Failed septic systems can be retrofitted with The Sanitizer™ by simply shutting off the septic toilet and using the rest of the system for graywater only. The Sanitizer™ can improve land value that before could not be developed because traditional sanitation was impossible. If you have a cabin, hunting/fishing camp, houseboat or sports area, The Sanitizer™ will help you enjoy them more! The Sanitizer™ can be supportive of our military personnel from the training field to the battlefield making it safer and more convenient for them. Emergency response teams working in disaster areas especially those involving flooding can instantly solve the sanitation problems by deploying The Sanitizer™ either on trailers or to replace failed systems as water subsides. Recreational vehicles, boats and emergency response vehicles can be adapted to The Sanitizer™ technology, eliminating that terrible purging of onboard bilge into the environment. Why is The Sanitizer™ different from other sanitation systems? Other forms of sanitation focus on removing human waste to some form of treatment system. Water based systems result in contaminating water to transport waste to treatment facilities that clean the water only to be polluted again with more waste. Composting processes the waste into some form of organic fertilizer or soil conditioner. Pit latrines need to be pumped and dumped in treatment facilities. But The Sanitizer™ sanitizes the waste on site and renders it harmless. How does The Sanitizer™ operate? The Sanitizer™ separates liquids and solids. It creates heat to safely evaporate the liquids and sanitize the solids. The resultant warm air is also circulated from the toilet through the unit. The airflow eliminates odors, evaporates liquids and renders solids hygienically suitable for disposal. How does The Sanitizer™ evaporate liquids? The warm air is channeled into a separate chamber wherein the liquids are deposited and introduced to a medium over which the air flows for complete evaporation. How does The Sanitizer™ treat solids? Within The Sanitizer™ the pathogens are safely killed by heat. The heated air flows over solid waste and reduces its original mass. The sanitized waste is then ready for subsequent disposal. Does The Sanitizer™ require water or chemicals to operate? No, water or chemicals are not needed to operate The Sanitizer™. Does The Sanitizer™ require electricity to operate? The Sanitizer™ operates with a minimal amount of electricity that is provided by normal household current. The unit can also be run from solar panels, generators or backup batteries. The Sanitizer™ requires a 20 amp circuit, 110 volts and 1700 watts of cycled power to operate properly. CUA does not provide solar panels or adapters. Is protective wear required to remove treated waste from The Sanitizer™ ? Protective wear is not needed in disposing of the sanitized waste. The process simply requires removal and replacement of the provided disposal bag which contains the processed sanitized waste. How often must The Sanitizer™ waste be removed? The frequency by which waste must be removed depends upon the number of uses. An average family of four would need to remove the bag of dried solids about every one to three weeks. Why Is The Sanitizer™ a Zero Discharge Sanitation System? “Zero Discharge Sanitation” means that no harmful effluent from the sanitation unit re-enters the environment, especially water sources. The Sanitizer™ evaporates liquid into the atmosphere and sanitizes and dehydrates solid waste for hygienic disposal. Therefore it is a zero discharge system unlike many other sanitation systems. What are the ecological benefits of The Sanitizer™? The ecological benefits of The Sanitizer™ are many. There is no discharge and therefore no danger of contaminating water sources. The solids are sanitized and hygienically disposed of so there is no pollution in the landfills. The Sanitizer™ does not use water resulting in a considerable savings of the traditional flushing. The amount of electricity required to operate The Sanitizer™ is minimal – about as much as a lamp requires. How much water does The Sanitizer™ save? Traditional sanitation systems that use water consume approximately 4000 gallons per person per year of “flush water”. The Sanitizer™ uses no water, which means that it potentially saves 4000 gallons per person per year! Also, by drawing sanitary waste (blackwater) away from the rest of the wastewater (graywater), it becomes easier to recycle the graywater for use in irrigation of lawns, shrubs and gardens. This could significantly reduce the amount of water used for those purposes. How well will The Sanitizer™ operate in adverse climatic conditions? The Sanitizer™ is designed to operate in any climatic situation. Can The Sanitizer™ replace a failed septic system? The Sanitizer™ is a wonderful solution to failed septic systems because septic systems are often over used due to the large amount of flush water that they must process. When the septic system fails, the toilet and blackwater can be cut off and replaced by The Sanitizer™ and the septic system can continue to dispose of the graywater with a much reduced water flow. Can The Sanitizer™ be used in disaster situations? The Sanitizer™ is perfect for disaster situations, especially those that result in flooded and fouled sanitation systems. The Sanitizer™ is compact, light weight and very portable. It is easy to ship and install and can be used immediately upon arrival. Since it sanitizes waste on site and does not discharge there is no added pollution to the disaster area. Its large capacity accommodates up to 100 uses per day per unit with no water or chemicals required. Operating off household electricity, The Sanitizer™ can also be mounted on trailers for greater portability and service to displaced populations.